If you spend any amount of time managing others, you will come to a time when you need to compose and deliver a disciplinary action. This is one document many managers struggle with composing and delivering to employees. A disciplinary action memo should be written clearly and directly, without being aggressive. One that is confusing or vague will not change employee behavior, which is the exact purpose of this memo. Here is an easy template to following when writing a disciplinary action. The memo can be composed with just four paragraphs, all focusing on specific behaviors, expectations, and results. Focused on the “what’s”, I refer to each paragraph as what happened, what was expected, so what, and now what. What happened: Described the employee’s specific actions or behaviors. A behavior is something that is observable, measurable, and factual. When describing behaviors, avoid using absolutes (always, never) and generalities (attitude, attendance). Instead of saying an employee has “attendance issues” or is “always late”, focus on specific behaviors such as “late 5 times of 10 minutes or more during the month of June). So What: Describe the negative impact resulting from the employee’s action. This section is especially valuable when communicating to employees who may not understand the importance of following a specific policy. When I worked in banking, I would remind branch employees that dual control is required to open the vault. If one person is late, the vault cannot get opened in time, tellers cannot get their cash drawers, and members cannot be serviced. Lateness ultimately effects teamwork and member satisfaction. Now What: Describe the implications to the employee based on his/her actions. This may include a formal warning period, restrictions, action plan, loss of bonus, demotion, and even termination. If there is to be a follow-up period, state the time frame and person responsible for following up. Keep in mind, this is a general guideline, and should not supersede any specific disciplinary action format your organization may have in place. Managers should always consult with your Human Resources department before presenting an employee with a written disciplinary action. 242 years ago, 56 men left their families and gathered in a steamy hall in Philadelphia. There, they committed to the boldest statement ever recorded. They knew they were embarking on a worthy cause, and also knew they would face obstacles along the way. They knew they would experience great sacrifice, as no worthy goal is accomplished without dealing with sacrifice along the way. John Maxwell’s Law of Sacrifice states “in order to go up, you need to be willing to give up.” Every person who has achieved any type of success in life has made sacrifices along the way. We are faced with limited time and resources. Regardless of whether your goal is to advance at work, improve your health, or increase your bank account, you will be faced with having to give something up in order to go up. As a trainer, consultant, and success coach, I work with individuals every day to be reach their fullest potential. While I provide individuals with the tools and resources required for success, it is be successful. It is up to them to use those resources to make a positive impact on their life. I routinely talk with people who wish they developed their skills, made more money, or got in better shape, but were unwilling to make sacrifices necessary to obtain those goals. You cannot get promoted at work unless you sacrifice the time and energy to learn and develop new and existing skills. You will not be able to lose weight unless you are willing to sacrifice some of the food you eat, and increase your exercise. You cannot increase your bank account without sacrificing some of your discretionary spending, and depositing that money into your account. What are your dreams and goals? What are you willing to sacrifice to achieve them? The bigger the goal, the bigger the sacrifice. We find that truth to be self-evident. This week, executives representing 32 teams will gathered in Dallas, Texas for the annual NFL Draft. NFL personnel spend months out of the year interviewing, testing, and analyzing hundreds of potential candidates. Teams select players based on their current and future needs, in addition to the players’ ability to fit into the team’s schemes and organizational culture. Teams know their selections will have ramifications on their organization’s success for years to come. How much do you invest in selecting a new employee for your team? According to a May 2017 SHRM article, the total cost of a bad hire can be “astronomical.” Costs include recruiting and advertising costs, onboarding and training costs. negative impact to existing employees and customers, and possibly the company brand. The same article quotes a 2012 CareerBuilder survey which 22% respondents admitted they lacked the skills to interview and hire employees effectively. This results in underperforming employees. Who do I want them to be? What do I want them to already know? One of my favorite exercises in the workshop is a scenario where I tell participants they are required to bring a new dog into their home. This is detailed in the chapter Choosing the Right Breed from my book Sit Stay Succeed! Considering where they live, their lifestyle, family members, and other pets, participants list qualities and characteristics they require the dog to possess. After all, I wouldn’t bring home a large Saint Bernard if I live in a small apartment. Participants review the list and circle their top three to five non-negotiable items. After we complete the dog exercise, we use the same principles to create a similar list for new employees. It is amazing how many participants tell me they have never spent this much time before in creating a list of skills and characteristics for interview candidates. The reason is probably not too surprising. That CareerBuilding survey found nearly half of the respondents said they made a bad hire because they felt rushed into quickly filling a position. When you attempt to fill a position with an employee who doesn’t have the necessary skills or characteristics to perform the job or align with your organization’s culture, you are asking for trouble. You can’t make a big dog a small dog, and can’t convert a 320 pound defensive linemen into a speedy receiver. According to a 2015 Time/Real Simple poll, 44% of millennials cited ‘fear of failing’ or ‘lack of confidence’ as a major reason preventing them from being more ambitious. Nick Foles was speaking in front of a hundred or so men and women who were eager to hear his thoughts. Just over 12 hours earlier, he led his team, the Philadelphia Eagles, to their first Super Bowl championship over the defending champion New England Patriots. Just two months earlier it was unlikely Foles would have ever thrown a pass in this game. Being votes game Most Valuable Player would have be unfathomable. 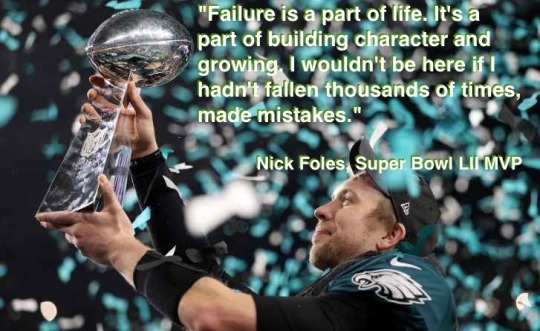 That’s why Foles has become an expert on failure, and his thoughts are beneficial for anyone looking for success. Nick Foles was drafted by the Philadelphia Eagles out of the University of Arizona in 2012. He split time as the starting quarterback his first two seasons. Along the way he tied an NFL record for most touchdowns thrown in a game (7) and set a record with the best touchdown to interception ratio (27-2). The start of a promising career will soon experience setbacks in 2014. Foles’ third year ended early after breaking his collarbone midway through the season. He was traded to the Minnesota Viking where he struggled and was released after just one season. The following year he joined the Kansas City Chiefs where he also struggled and was released after just one year. Foles got a new start in a familiar place, Philadelphia, where he was content to back up start quarterback Carson Wentz. Everything changed when Wentz tore his ACL in a November game, and Foles found himself back in the starting role, ultimately leading the Eagles to a come from behind Super Bowl win. If you are unwilling to fail, you won’t be open to embarking on new challenges and taking chances. This leaves people stagnant and under-inflated. Your company should create a culture where it is Ok for employees to fail. This allows employees to think outside the box and take calculated chances without fear of repercussion if things go wrongs. A young child falls hundreds of times before he or she finally learns to walk. What if every child would give up after falling down just a few times. What a tragedy to live in a world where no one is willing to take a step forward to see where it leads them. James Cameron’s Titanic was released 20 years ago this month. My most request presentation discusses lessons learned from the Titanic disaster and how they can apply to your organization. In celebration of the movie’s 20th anniversary, the following is a snapshot of my Leadership Lessons of Titanic. Leadership expert John Maxwell states “Everything rises and falls on leadership.” The maiden voyage of the Titanic was Capt. E.J. Smith’s retirement trip. His final duty was to pilot the grandest ship ever built into New York Harbor. However, Smith took many safety issues and precautions for granted on the trip. He ignored multiple iceberg warnings from his crew and neighboring ships. Leadership is about everything you do, and the things you don’t do. Maxwell says “Leadership is influence, nothing more, nothing less.” The leader sets the stage and influences others to act; the leader is always present, event when he/she is not there physically. Titanic was the largest ship of its time. It was such a large ship that it took nearly a minute to steer away from the iceberg, and many believe that delay in changing course was the biggest factor in its sinking. As a result, the iceberg ripped a large gash in the ship’s hull. The bigger the organization, the more difficult it is to steer, direct, and change. In large organizations, policies and procedures may sometimes circumvent common sense. How long does it take your company to change its course? How many levels does it take to change policy/procedure? A common thought is Titanic was grossly negligent because there were not enough lifeboats aboard the ship. According to regulations of the time, the requisite number of lifeboats was in direct proportion to the ship’s weight—to a point: The regulation stopped calculating at 10,000 tons, for a maximum of 16 lifeboats. Titanic, at more than 46,000 tons, carried 16 lifeboats. After Titanic sank, regulations changed to calculate the number of lifeboats according to the number of passengers. As a leader, you should routinely review and reevaluate the policies and procedures of your organization. Be aware of shifts in company culture or focus that warrants a policy change. Just because procedures always worked a certain way does not mean it cannot be done more efficiently or successfully. ‘On the night Titanic sunk, because the moon was not out and the water so still, it was very difficult to see the iceberg. Rough waters would have caused breakers around the iceberg, making it easier to see from afar.’ - The Discovery Channel. Titanic was sunk due to damage created by the part of the iceberg hidden beneath the water. Peter Drucker said “Culture eats strategy for breakfast.” The culture of your organization defines the environment in which your employees work. Culture cannot be dictated; it is developed, usually from the collective traits, beliefs, and behaviors of your employees. As Titanic was sinking, crew members struggled with releasing the lifeboats. They did not have the proper training on how to utilize the lifeboats in the event of an emergency. Deployed lifeboats were loaded with too many or too few passengers, and only one returned to attempt to recover more people. Effective leaders understand the importance of a structured orientation and training program. If we fail on developing our employees, we fail everyone who depends on our company to succeed. Twenty years ago, James Cameron was determined to make a movie featuring an exact replica of Titanic, and recreate the most realistic sinking of the ship. The movie cost more to make and longer to shoot than was originally planned. The movie wasn’t going to be ready for its planned July 4 release. Cameron was at odds with the studios financing the film. Critics thought the picture was going to be a disaster. All the while, Cameron never lost sight of his goal. Titanic went on to become the highest grossing picture of all time, holding the top spot until being supplanted by another James Cameron film. Law of Leadership is the Law of Legacy. As a leader, we are making a lasting impact on everything and everyone with who we interact. Do you want to ultimately be remembered as the most esteemed commander of all time, or the person who sank Titanic? With all of the stories of former pitching great Roy Halladay, one specifically comes to mind. This is a great example of Halladay as a person and teammate, and is a reminder of how we all should appreciate teamwork in the workplace. In everyone’s line of work, there are co-workers who have different roles and responsibilities. They all possess various strengths and weaknesses. To be successful, teams on and off the field, parley each other’s strengths to reduce their weaknesses. This is the reason why teamwork is so important. Not everyone recognizes the importance of their co-workers contributions, but the top performers do. They understand the fact they can’t succeed without the help of others. Roy Halladay understood that, which is why he presented all of his co-workers with such a token of appreciation. While you are not in the position to spend thousands of dollars on such a lavish gift, a thank you note or email would suffice. So if this sounds like an easy concept to grasp, why is there such an overabundance of books and resources to improve teambuilding skills at work? It is because in most workplaces people get rewarded for their individual accomplishments rather than those of the team. Your role at work can change from one year to the next. Your position is attained from years of developing skills, oftentimes as the expense of somebody else’s aspirations. Everybody can aspire to become manager, or even CEO. In order to move up, employees must look for ways to showcase their talent and promote their successes. However success cannot be obtained without the help of others, and the person you help today may be the person helping you tomorrow. The National Basketball League starts it season this week. The leagues requires three basketballs are available for each game; however, the game is usually played with the same ball for the entire game. The only time the ball is changed is if something effects the ball making it become deflated. Have you ever tried to play with a basketball that wasn’t fully inflated? It doesn’t perform the way it was intended. The ball won’t bounce properly when you dribble it. The ball won’t rebound off the backboard, allowing you to score off a missed shot. It will lack the velocity and voyage necessary to travel the distance required to make a three-point shot. To put it bluntly, a basketball that has been under-inflated will underperform and disappoint. The same holds true for people. When an individual is under-inflated, he or she is not living up to their fullest potential. In some instances, the person is lacking certain knowledge or skill. In other vases, they may know exactly what to do and exactly how to do it; but are still not living to their fullest potential. I believe we were all born with great gifts, and with the ability to do great things. Some of us are struggling to discover our gifts, or how to put them to use. Others must overcome their fear and doubt to embrace their gifts, and gain the courage to change their lives. Most people settle for average because they are not consciously aware of how to change, or fall into a preprogrammed belief regarding the limit of their capabilities. Motivational and self-help expert Tony Robbins says “change happens in an instant.” People think it takes a long time to change, but that is simply not true. It takes a long time to get ready to change, to think about changing, and to finally accept they deserve to change. There will be a process to go from where you are currently until you reach your goal, but the initial change happens instantaneously. Think about the process to inflate a basketball. The moment you add the initial burst of air, the ball starts to inflate. Right away, you are making progress towards your goal. It may take time to gather the inflation needle and pump, the resources required to reach your goal. It may also take time to fully inflate the ball, depending on how deflated it is to begin. The process begins the moment you take action; change is truly happening in an instant. Be open for change; do something every day to enrich your life. Get your bounce back! I am a trainer, speaker, and success coach. I take great pride in developing individuals and providing them with the tools to reach their fullest potential. I find success when my clients find success. As a personal success coach, I often help people breakthrough the feeling of being an “Imjusta” employee; as in Imjusta teller, Imjusta loan processor, Imjusta mail clerk. Henry Ford said “whether you think you can or think you can’t – you’re right.” Many people are fearful of the unknown and of learning something new. We know what we like, and know what we do well. Changing our routine, responsibilities, or expectations in our personal and professional lives is downright scary. I believe in big-box thinking. I tend to think the person holding us back the most from succeeding is ourselves. By labeling ourselves as what we are, and what we’re not, we put limits on what we can ultimately become. With that launch, he revolutionized the way we listen to music and buy songs. How archaic does it sound now to waste money on an entire album when all you want to hear is three good songs? Not only did the iPod forever change the music industry, it also changed Apple, the company which created it. Apple was once a computer company, selling desktops and software. Today, less than 20% of their total revenue comes from selling computers and software. Think about where we would be today if Steve Jobs referred to his company as Imjusta computer company or Imnota music company. It would be an awful lot tougher walking around with 1,000 songs in your pocket if they were all cassette tapes. Making changes is difficult; you need to learn something new and change your behavior. There is that period of adjustment and inconvenience – sometimes we wonder if it ever going to end. Anyone who has ever renovated their kitchen or bathroom knows how much of a hassle it is initially; but we understand how great it will be when the dust finally settles. Are you making problems too complex you won’t take action? Sometimes we look for complex answers to easy questions. We look at a some challenges as impossible, obstacles as insurmountable, and before you know it, we become so overwhelmed with a situation we decide not to do anything at all and hope it works itself out. You don’t have to continually search for an answer which is right in front of you. Occam’s Razor states the simplest most obvious answer is usually correct. This is a simple principle people can apply to dealing with problems in their personal and professional life. Instead, many people suffer from a paralysis by analysis; they spend so much time pouring over details and variables they continuously ‘plan to plan’ and never get around to taking action. Fall is officially here. Students have returned to school, swimming pools are closing, and the baseball regular season is winding down. This is the perfect time to discuss the Baseball Rule of 54, and how it applies to life. Major League Baseball teams play 162 games each year. The Rule of 54 states that every team, no matter how good they are, will still end up losing 54 games each season. The rule also states every team, no matter had bad they are, will still find a way to win 54 games each season. What each team does in the remaining 54 games each year determines who finishes in first place, and who finishes in last. This rule applies to our personal and professional life as well. We will all have good days and bad days. You will never be as bad as your worst day, and you’ll never be quite as good as your best day. How you perform day in and day out, facing and overcoming obstacles, rebounding ater a defeat, and keeping level-headed after a victory, will ultimately determine how successful you will be in life.